TM Italia > News > Via Larga 3. 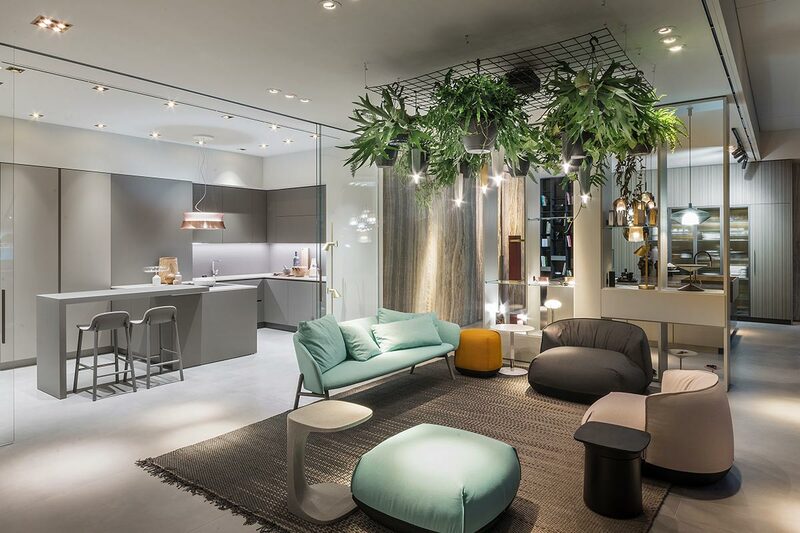 In Milan, TM Italia lives a new exhibition space dedicated to high Italian design. 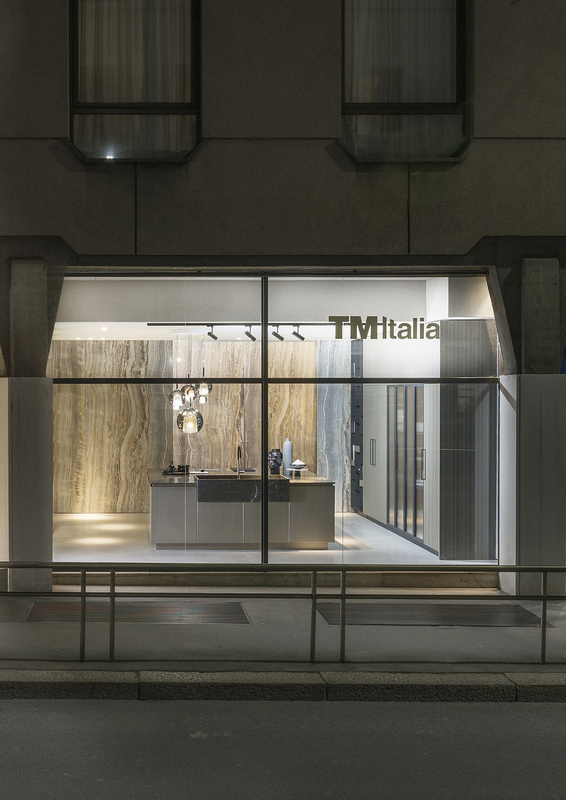 A new TM Italia’s Atelier is born in the heart of Milan, a new scene that celebrates the values of a company that combines advanced craftsmanship and a sartorial vocation in high-end kitchens. The space, which opens today Tuesday 9 April 2019, is located in Via Larga, corner of Piazza Santo Stefano, 5 and is part of an area of ​​the city that already houses the sales points of some of the most famous design brands. 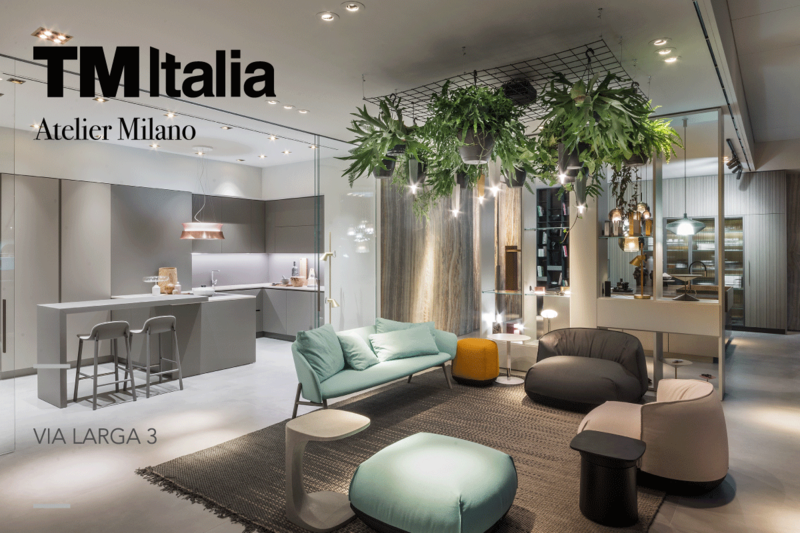 The entire exhibition space – over 200 square meters, curated by Nicola Gallizia and co-designed with Alessandro Ruga – is managed by Mauri & Mauri Arredamenti, a commercial partner of the best Italian design companies. 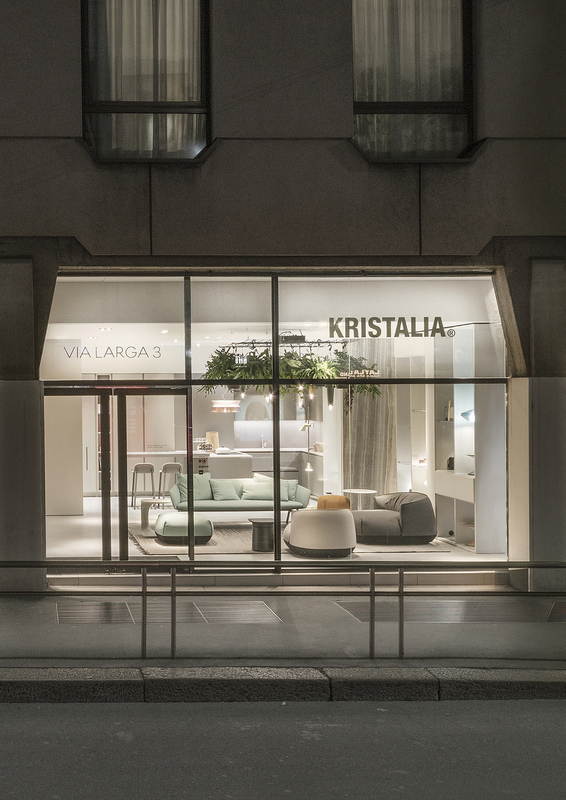 The new store is called Via Larga 3 and, in addition to TM Italia, it hosts three other furnishing companies: Henry Glass (glass doors and high-quality systems for architecture and Interior Design), Kristalia (furniture of design), Penta (lighting systems for domestic and public environments). The atelier is characterized by its brightness, thanks to the large windows: inside the space, the products take the spotlight enhancing design and materials; the essential lines play with the neutral colors of floors and walls, and interact in a coherent way with the preciousness of the materials. The large onyx-effect ceramic panels with shades of grey-blue to light browns, as well as the finishes of the doors that filter the different areas, make the spaces harmonious and refined. The result is a total aesthetic balance. For TM Italia, Neolite – design ruadelpapavero -, Rua – design ruadelpapavero – and T45 – design TM Italia R&D – occupy respectively the areas on the far left and right with respect to the entrance; K6 – in an articulated composition designed by Nicola Gallizia and Alessandro Ruga – is positioned instead at the bottom, in the area dedicated to show-cooking. In the Neolite kitchen with island, precious materials with contrasting textures coexist in harmony: antique bronze doors, natural “Brown Gold” stone, sycamore wood for the structures and for open compartments that become small chests with attention to the smallest details. The combination of the columns of Rua with the island of T45 offers a sophisticated reinterpretation of the large lofts, with the use of natural materials and unique details: oak wood on black tinted cores and refined Scannellato belga crystal glass for the column doors, lacquered metallic effect with a Champagne finish for the island doors, Corinthian stone for the top whose sink is assembled in the same material. 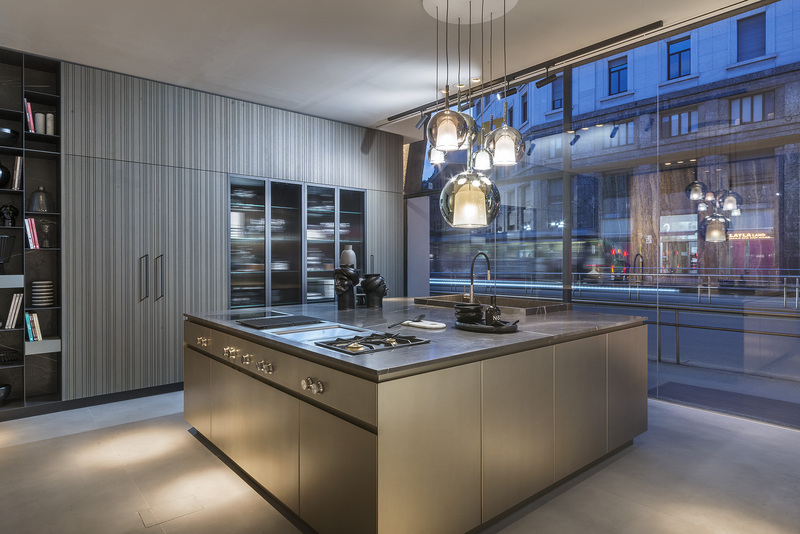 The K6 kitchen, positioned in the show-cooking area, is presented with a refined chromatic accord in shades of beige and grey giving a modern and functional look. 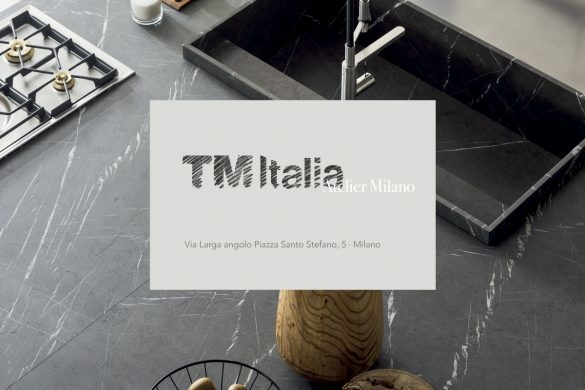 The versatility of the production represents very well the planning and realization ability of TM Italia, an eclectic company able to give life to unique pieces remaining anchored to a well-defined vision of quality and style. Internationality, high positioning, business strategies, Made to Measure culture: these are the concepts on which this new commercial reality is based, concepts shared between the four brands, while respecting individual identities thanks to dedicated and customized exhibition areas. 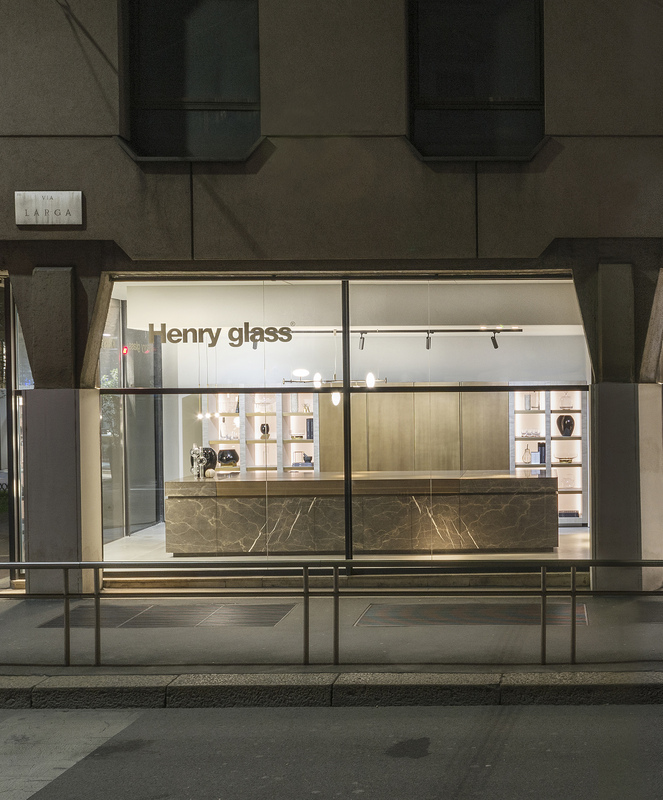 A temporary exhibition space was also created inside the store, an area in which the layout will change in rotation depending on the season, commercial needs or market trends. 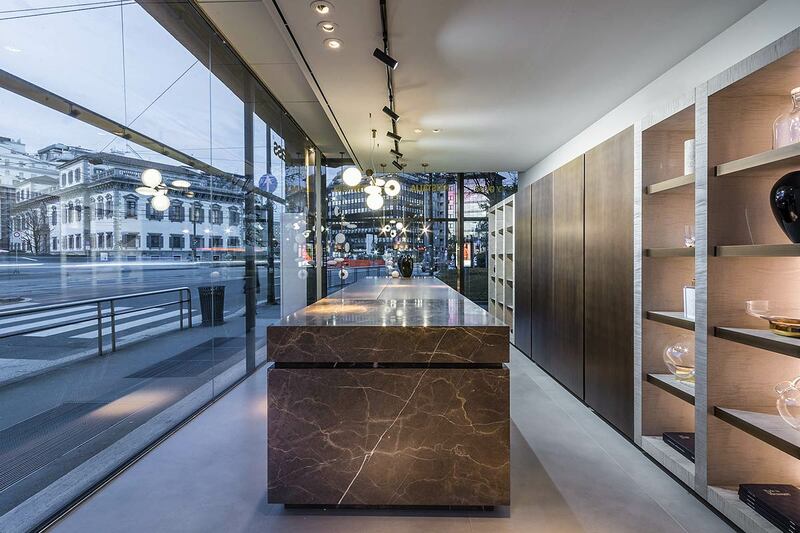 In addition to an area for private meetings with customers and architects, a “materials’ library” was also provided: a shared library where the variety of finishes and materials of all the brand partners is presented. Stay updated on upcoming news about TM Italia. TM Italia has reserved an exclusive space in which to retrieve documents and materials that can be used to gain a greater understanding of our company and our products.